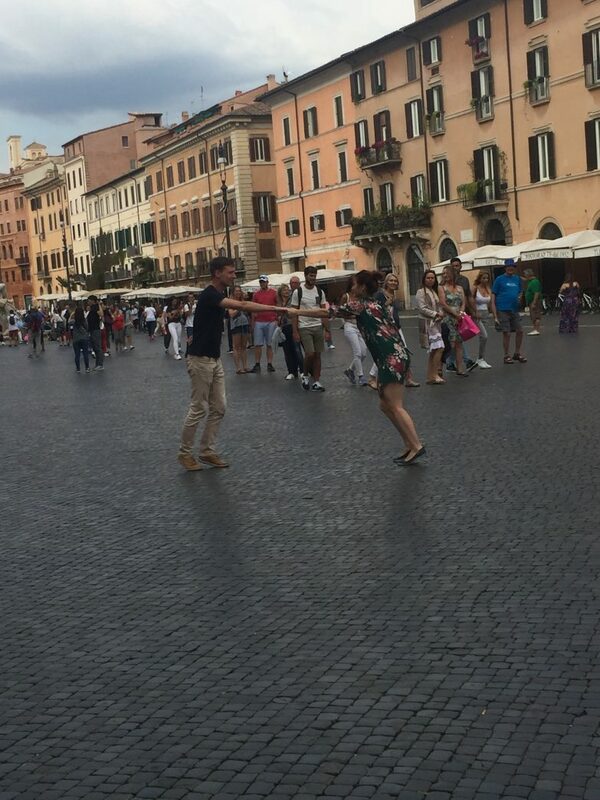 Why is Bella Roma so internationally loved? 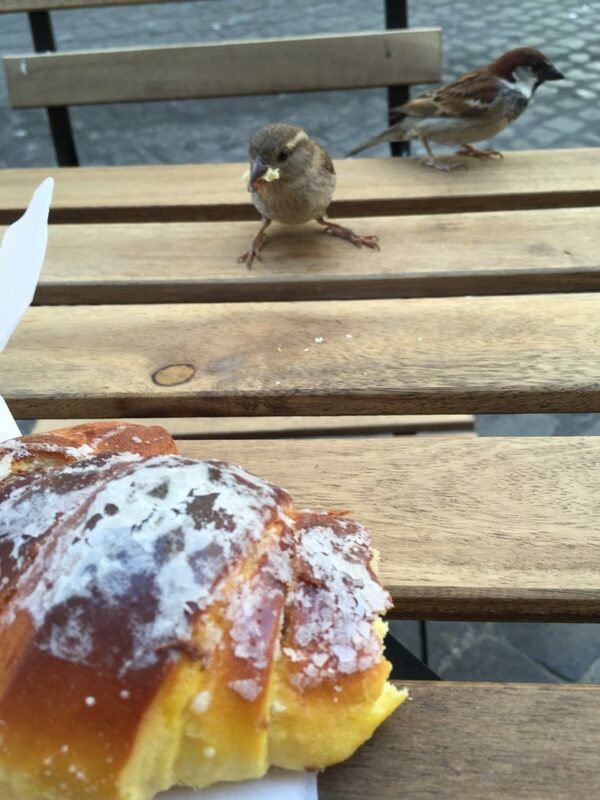 Rome is wild, loud, beautiful, and always unpredictable. There is honestly so much to love about Rome that I am doing her a disservice listing only 5 things to be crazy about. Go to Rome armed with these 5 things and make up your own list of favorites. Rome is a city filled to the eyeballs with art. It is everywhere. A trip to the Vatican Art Museums is a must when visiting Rome because it is the greatest collection of fine art in existence. Much of it is Renaissance Art. The Vatican Museums were originated by Pope Julius II in 1506. At that time, Michelangelo was working at the Vatican for Pope Julius and the pope had Michelangelo go and look at a sculpture that had just been found and unearthed in a roman vineyard. Michelangelo confirmed that this sculpture was the original Laocoon and his sons which had been praised in the writings of Pliny the Elder centuries before. Based on the recommendation of Michelangelo, Pope Julius purchased the statue and placed it on display in the Vatican. Since that time, different popes have added art to the museums and have had to add new wings to accommodate it all. A tour through the Vatican Museums is like taking an art bath. You see it, breathe it and take it in through your pores. Like a perfect bath, it refreshes you and gives you new life. Make sure you avoid the lines and headaches by booking yourself a tour. 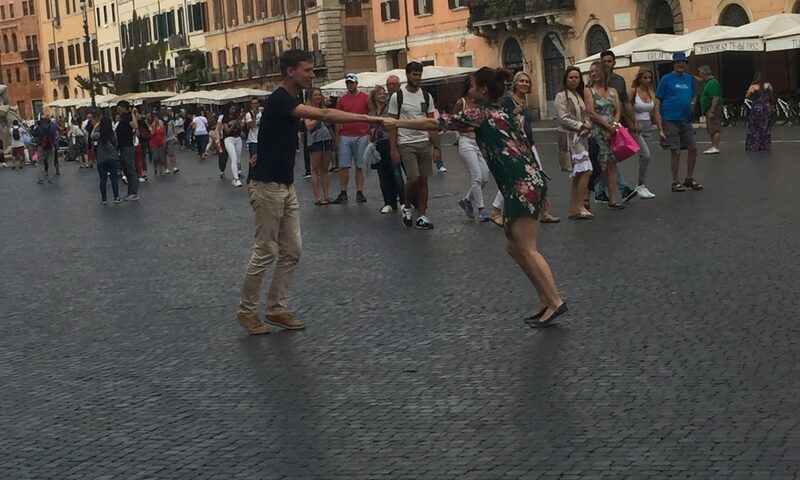 I like Through Eternity Tours in Rome because their tour guides are well trained, personable, entertaining and professional. Book months in advance because they fill up, especially in Summer. The museum contains paintings by Caravaggio, Leonardo Da Vinci, Raphael and, the entire Sistine Chapel ceiling painted by Michelangelo between 1477 and 1480. 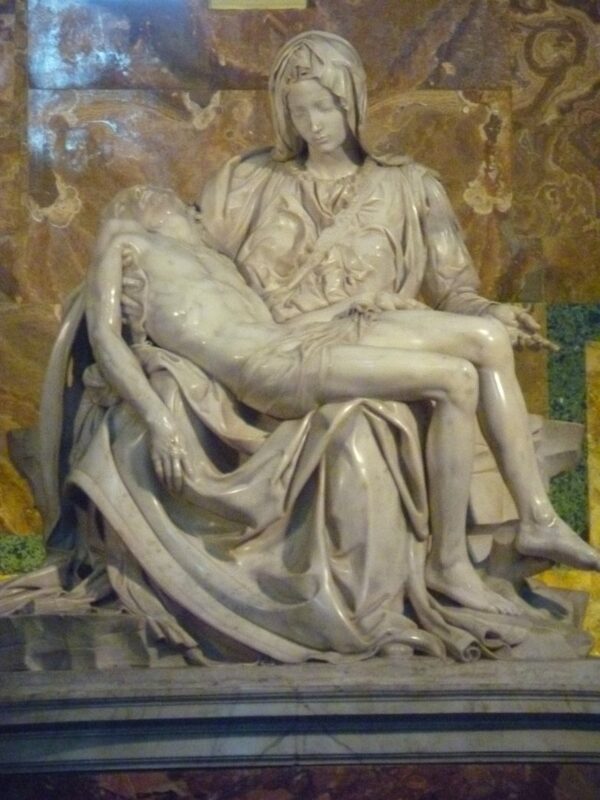 The museum tour includes a visit to St. Peter’s Basilica which contains the amazingly beautiful Pieta sculpture, sculpted by Michelangelo from white Carrera marble when he was only 24 years old. Michelangelo was such a prolific artist and you will see many of his pieces on this tour. You will see why he is still the most beloved artist ever born and so cherished by Italians. Or Café Macchiato or Café Latte, or Cappuccino. When ordering coffee in Rome, understand that if you order coffee (or café) you will get a tiny cup filled with fiercely strong and biting espresso. The Italians don’t fool around with their coffee. It is a source of pride. If this is too much for you, you can order a café latte. Don’t confuse a cafe latte at Starbucks with a cafe latte in Rome. Both cafe latte and capuccino are perfectly blended combinations of milk, coffee and in cappuccino, chocolate. Don’t order a “latte” as we do here in the states or you will get a glass of milk. Having heard that ordering coffee with milk in it after lunch was taboo all over Italy, I put this to the test in Cremona one afternoon. My friends and I entered a small café and a tiny Asian lady attended us. My friends ordered their café and I looked at her and asked for a café latte. Her perfectly crafted eyebrows shot up into her hairline in surprise. She covered it well and brought me my café latte but I am sure I was forever branded a tourist in that shop. A café macchiato in Italy is espresso with a small amount of milk in it but still strong. I have ordered this after lunch and the eyebrows rose minimally so I think it is ok. If you like your coffee a little weaker, you can order a café lungo which is an espresso with a small amount of water in it. The Italians, recognizing that Americans drink our coffee differently, have created a café Americano which is espresso with more water. 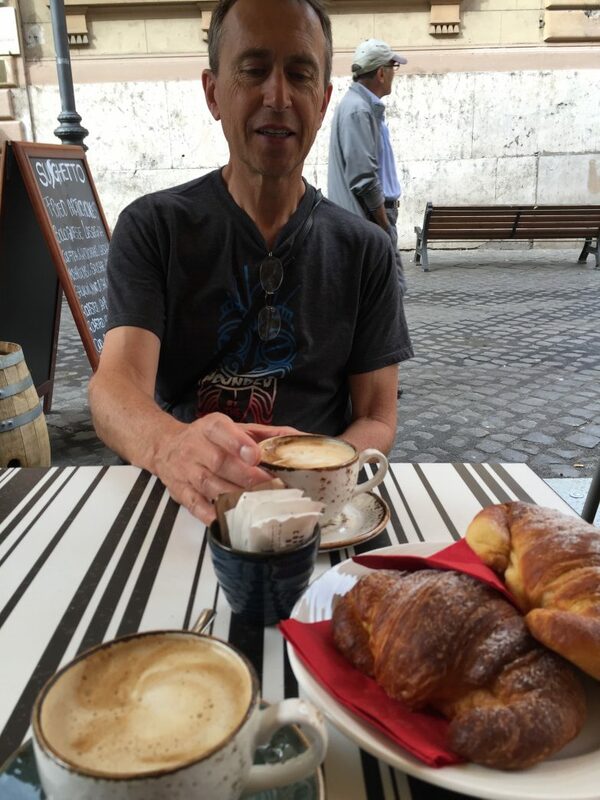 The coffee in Italy is, to my mind, the best in the world. Great care is taken to make it perfect and bar staffs are well trained. Even the ground coffee you purchase in the supermarket is top notch even though it is inexpensive. Order a cafe, dump a packet of sugar in it and stir. You are rewarded with a couple mouthfuls of the sweetest, bitterest, most fragrant and coffee-est sip you can imagine. You digest your food better and you are wide awake for several hours. Rome has several fine shopping districts including the Via Veneto, which is a street dedicated to shopping and outdoor cafes. 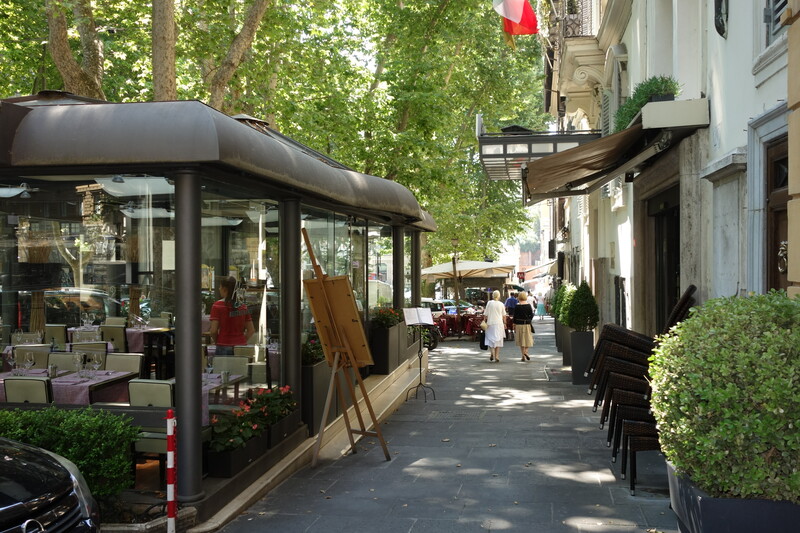 It is a beautiful tree lined street and an afternoon spent in a sidewalk cafe watching the beautifully dressed Italian businessmen and women go by is a treat. Italy is well known for fine Italian leather goods. Italian leather crafting goes back centuries. The Via Veneto has many fine leather emporiums however I have found that going a few streets over can save you money. Aside from the shopping that you would normally expect from a large city, Roman streets are a riot of colorful outdoor markets. 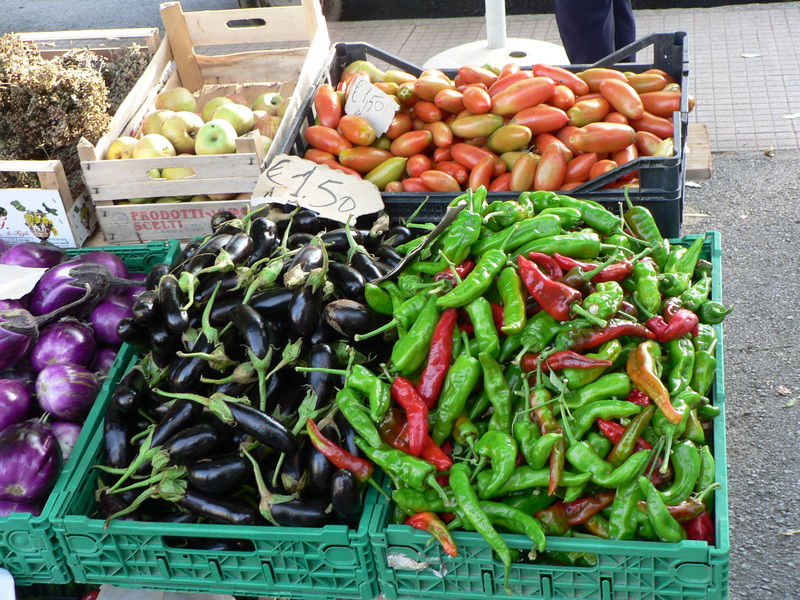 Every day you can purchase fresh produce and other delectables at the Campo De Fiori (literally, The Flower Market). This market has been going strong since medieval times. The Italians have raised cooking to a fine art form and almost every restaurant I tried has been amazing! A similar meal here in California would be ruinously expensive. 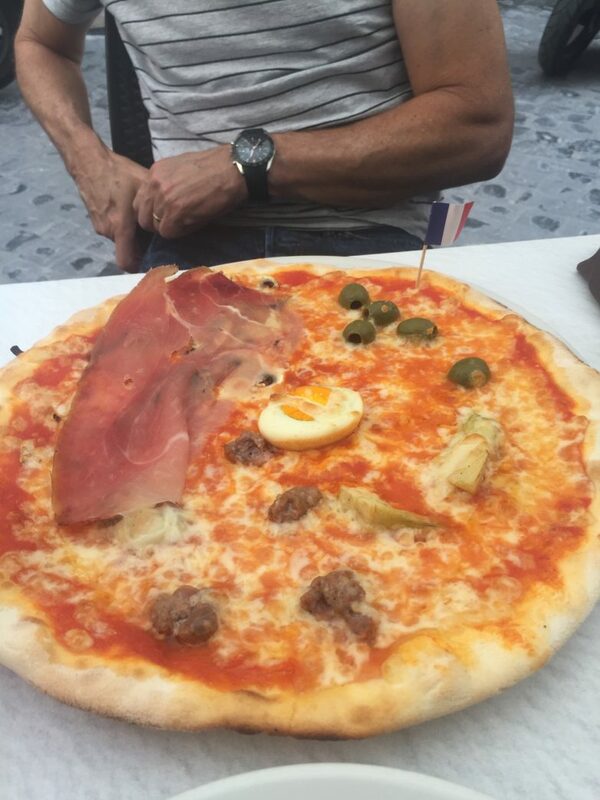 I never go hungry in Rome. Even when I have just eaten I am eagerly looking forward to my next meal. Even those with dietary restrictions can relax as vegetarian cuisine is always available and I had no trouble finding gluten free meals that were unbelievable. Only once have I had a bad meal in Italy and that is when Pete and I unadvisedly ducked into a restaurant right next to Termini Station, the main train station in Rome. Pete’s pizza was hard and burnt and my Roman artichokes hung their heads limply as if they had a severe case of erectile dysfunction. Whenever possible, stay away from any eating establishment close to the train stations, the monuments or any of the touristy areas. 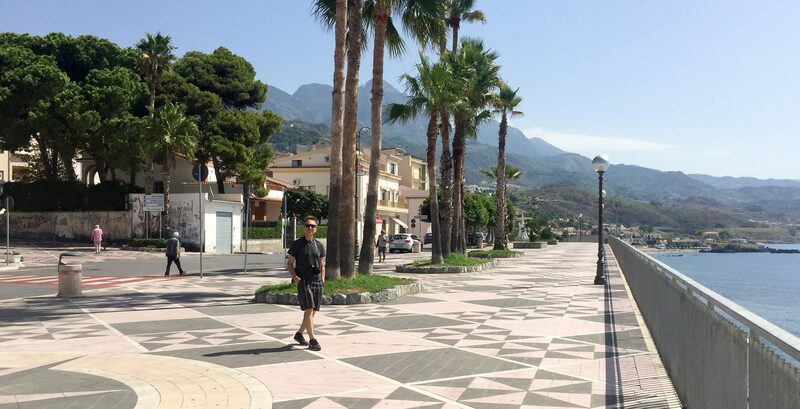 If you find yourself in a touristy area and you are hungry, walk a few streets away from the attraction and you will likely find a great place. In my experience, you are not taking much of a chance as most restaurants are operated by people who have pride in what they serve you. 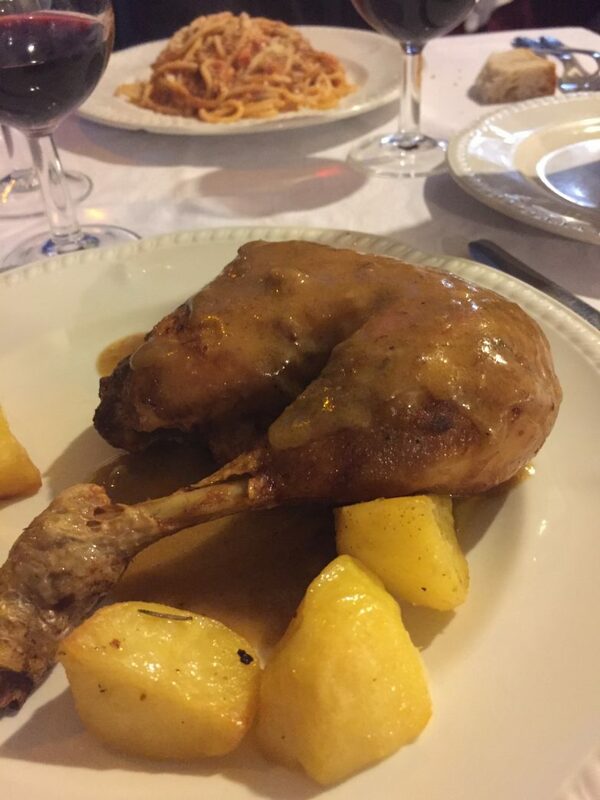 I can guarantee you that when in Rome you will eat well if you look for restaurants not geared for tourists. Rome was the seat of the entire Roman empire which encompassed all of Europe, a big chunk of the Middle East and the United Kingdom and then some. It was HUGE and Rome was the center of it all. 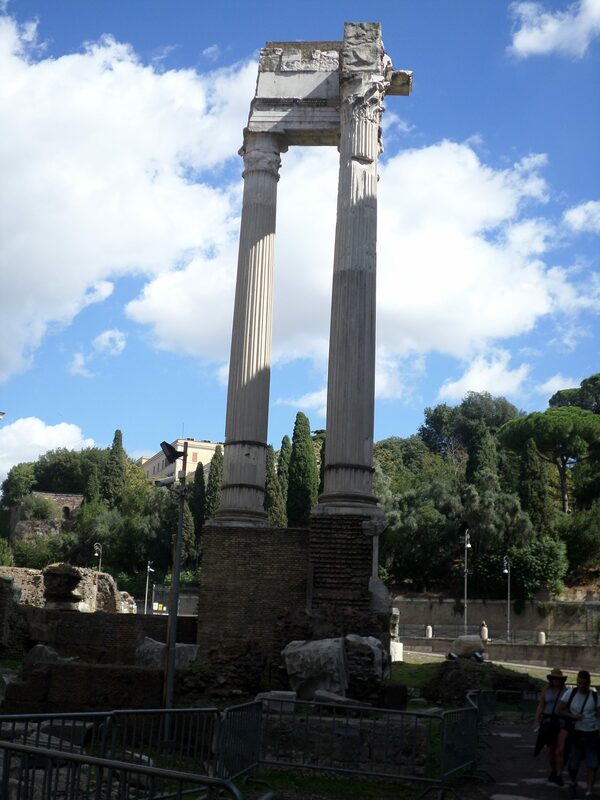 Everywhere you look in Rome are ancient ruins dating from different times and civilizations in the past. Sweeping your eyes from one side to another at any raised point in Rome presents a dizzying array of structures each with its own history, people and civilization. Any of these magnificent structures generally has a tour associated with it. You can learn so much history here in a few days. And the history itself is standing right in front of you. 6) Lastly and bestly, The Italians! I know I promised you five great reasons but I am including my favorite one as a bonus reason. The Italians I have met in my travels have been the most amazingly wonderful people. But what would we expect from the descendants of the greatest ancient empire in the world? Go and visit them. Visit their cities and revel in their art. There is a reason that the great artists wound up in Italy. And Rome is where it all begins. Start planning your trip to Rome. Contact us. We have some of the most radical travel pros standing by and we can craft a perfect vacation for you.